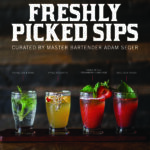 Big Daddy’s Brew & Que a fun, social, authentic Southern BBQ eatery with a bar program by Master Bartender and Advanced Sommelier Adam Seger, highlights the flavors of fresh-picked fall herbs in their new Garden-To-Glass cocktail flight for $11 during the month of October. 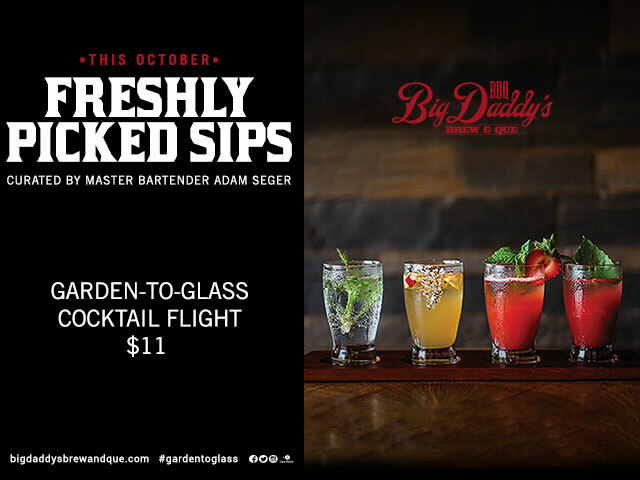 Big Daddy’s is delivering bar patrons freshly-picked sips in their Garden-To-Glass Cocktail Flight featuring four exclusive 5oz. cocktails that they won’t find on the regular menu once October is over. Enjoy this Garden-To-Glass Cocktail Flight during the month of October. Showcasing a love for big flavor, big brews and big barbeque, Big Daddy’s melds the authentic flavors of the South in the heart of the Midwest. does insurance cover viagra Under the menu curation of Chief Operating Officer, Restaurant Division, Sherry Yard, the restaurant brings together the best of barbecue, Milwaukee craft brews, killer libations and all the fixins’. Guests can enjoy a variety of bold flavors between the buns with delicious BBQ sandwiches and more and get a taste of the South with Big Daddy’s classic Hickory-smoked barbeque. Big Daddy’s is located at the Bayshore Town Center at 58000 N Bayshore Dr. Glendale, WI. For more information visit www.bigdaddysbrewandque.com.